As the rival tickets visit battleground states, Romney's position on budget issues is unclear. COUNCIL BLUFFS, Iowa – Led by President Obama, Democrats claimed Monday that Republican challenger Mitt Romney privately backs controversial plans to overhaul Medicare and cut trillions from social programs that his new vice presidential running mate has publicly proposed. Rep. Paul Ryan “has given definition to the vague commitments that Romney has been making,” Vice President Joe Biden said as the Democrats welcomed the Wisconsin lawmaker to the race with a barrage of criticism. “There is no distinction” between the two, he said. 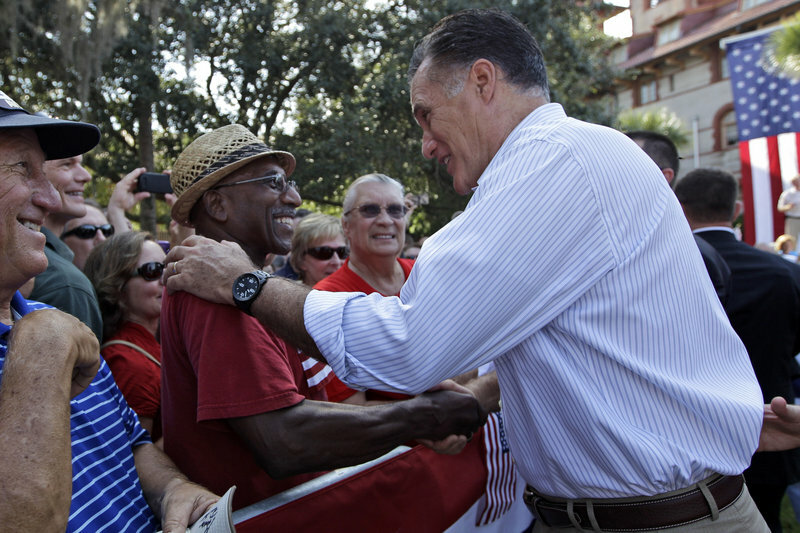 Romney lauded his running mate’s work as he resumed his own four-day bus trip through campaign battleground states. The former Massachusetts governor did not say so, but the tax and spending plans Ryan produced in the past two years as chairman of the House Budget Committee call for the repeal of Obama’s health care plan but also would retain the $700 billion in Medicare cuts that were part of it. Romney said there may be differences between his own budget plan and Ryan’s, but he refused to say what specific policies his budget would include that would differ from the Wisconsin congressman’s detailed proposal. Aides said during the day that Romney has long disagreed with that specific element of the House Republican plan, and they said while he wants to repeal the health care law, he also wants to restore the funds to Medicare. The day marked a first in the race for the White House, with both major party tickets campaigning at full strength and a little more than 80 days remaining in a campaign dominated by a weak economic recovery and a national jobless rate of 8.3 percent. Polls taken before Romney added Ryan to his ticket over the weekend showed Obama with a slender advantage in a contest that will be decided in eight to 10 battleground states. Large crowds turned out for Romney and Ryan’s joint appearances over the weekend, and conservatives have hailed the selection of the Wisconsin lawmaker, who is regarded by fellow Republicans as an intellectual leader within the party on budget issues. Democrats counter that Ryan’s presence on the ticket will make it easier to tag Romney with political ownership of the budgets that Republicans pushed through the House in 2011 and again this year. They say it will help their candidates in House and Senate races as well as the campaign for the White House. As chairman of the House Budget Committee, Ryan was the chief architect of tax and spending plans that called for turning Medicare into a voucher-like program beginning a decade from now. Critics say it would lead to higher costs for beneficiaries, while supporters argue that a fundamental change is needed to prevent the program from going bankrupt. Ryan’s budget also calls for cuts of more than $5 trillion in other projected spending over a decade as part of a plan to ease future deficits. While the candidates engaged in campaign rituals — Ryan attended the Iowa State Fair in Des Moines and Obama snacked in Denison, Iowa, on a rainbow snow cone — the costliest ad campaign in history churned on. That was a reference to a commercial aired by Priorities USA Action, which supports Obama, in which a retired steel worker suggests Romney and his private equity firm, Bain Capital, bear some responsibility for his wife’s death from cancer. The ad has been judged harshly by independent fact checkers and vociferously disputed by Romney’s campaign. Even so, Obama’s re-election aides decline to disavow it, noting they are barred by law from coordinating efforts with the outside group. Campaigning in person, the rival tickets ranged over some of the nation’s most heavily contested terrain. Obama set out on a three-day tour of Iowa, traveling in a black bus bearing the presidential seal on the side. Ryan was in Iowa, too, Biden in North Carolina, Romney in Florida. Fairgoers who attended his brief address were largely positive. Protesters interrupted him several times, chanting “Stop the war on the middle class,” and one woman climbed on stage with Ryan before security could drag her away. “She must not be from Iowa,” Ryan said. 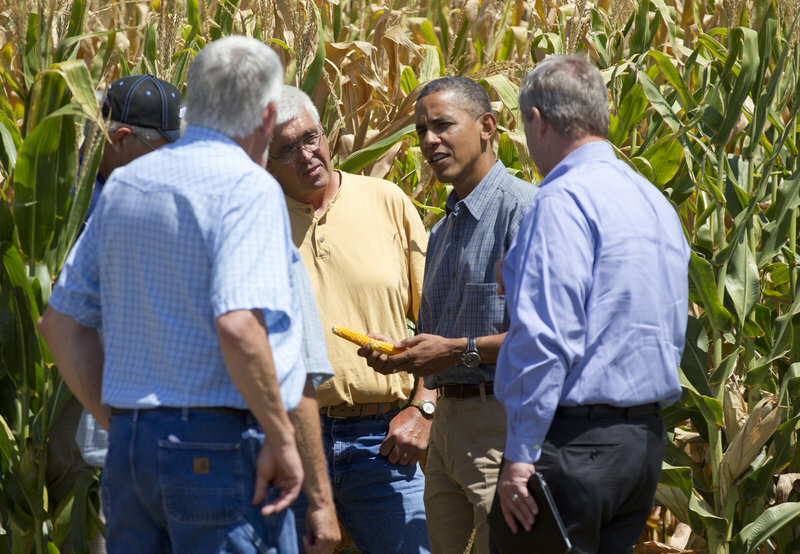 Obama had a jab of his own as he spoke to a crowd in Council Bluffs in the dusty, drought-ridden Midwest. Romney’s campaign dismissed the criticism. “No one will work harder to defend farmers and ranchers than the Romney-Ryan ticket,” said spokesman Ryan Williams. In criticizing Ryan and other Republican lawmakers, Obama omitted that the GOP-controlled House approved a short-term drought relief bill before Congress left the Capitol for a long summer break. The measure is stuck in the Democratic-controlled Senate, where leaders prefer action on a longer-term farm bill that cleared on a bipartisan vote and includes the emergency aid. With lawmakers gridlocked and away from the Capitol, Obama said the government would buy more than $150 million worth of meat and fish to help producers.